Consumers have looked to Western Union® to help them stay connected to loved ones around the world for more than 150 years. We are a global leader in money transfer services, offering the ability to send money to more than 245,000 Western Union Agent locations in over 200 countries and territories. Postal Bank account holders receive more! Postal Bank account holders receive 10% discount on sending fees! The Israel Postal Bank is glad to present a new service – international money transfers from your personal computer! Account holders are now able to perform activity in their accounts, including international money transfers, via our "Home Banking" site. An easy and simple registration where all that needs to be done is to go to one of our branches and ask to join "Home Banking" service at level 4. By doing this you will be able to send money directly from your personal computer! Special Bonus! Transfer money directly from your home computer via Western Union and enjoy NO COMMITIONS ON YOUR FIRST TWO TRANSFERS! For sending or receiving money in minutes – the Western Union International Money Transfer Service – EXCLUSIVELY IN ISRAEL at these post office branches. This service enables you to transfer money to and from Israel in minutes, without a bank account. 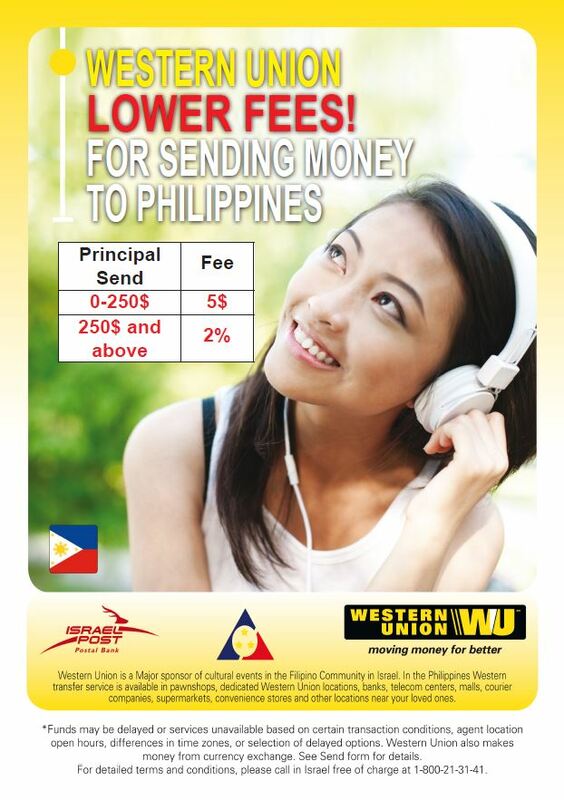 Go to one of the post office branches that offer the Western Union International Money Transfer Service. Within minutes the money will be transferred from Israel to the beneficiary abroad, at one of the 245,000 Western Union agencies located in 200 countries worldwide. The Western Union Center at the Banking Service can answer any questions you may have regarding how to transfer money and commissions, and can provide you with a list of agencies worldwide. 1. Special rates for transfers to the Philippines. 4. Special Rates for transfers to Romania. 5. For information about reduced rates and special offers to Sri Lanka, India and Nepal. 6. At post office branches where foreign currency is sold, transfers may be made in sheqels or in dollars. Payment will be made in local currency or in dollars in accordance with the laws of the country. The commissions charged for the WESTERN UNION service are quoted in dollars, as the charges are set by WESTERN UNION. However, the commission at the post office must be paid in shekels only. The principle sent may be paid in shekels or dollars*.